A modern electric car under the solar carport is considered chic and responsible. 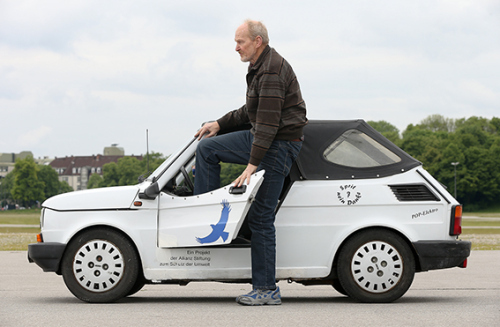 25 years ago it was different: drivers of electric cars were derided as crazy tree-hugger, the technology had to gather together and prove himself a talent for improvisation in the use of solar power. One who has accompanied this pioneer times from the beginning, was the journalist Peter Hays. Here he talks about how bizarre it was a test driver before electric cars. And how he met a number of people that it even then absolutely serious about the electric mobility. It all started in 1987 when I with his scooter portrayed the English inventor Cedric Lynch-yourself. With its fully enclosed, aerodynamics committed bicycle everywhere he made a stir when he approached silently. Sovereign smiling Lynch drew it by the London Borough of Islington, although passers nachstarrten the vehicle as if it were an Asterix and Obelix mobile wood and goat skin. Lynch and London were my introduction to the world of what was then the verhohnepipelte scooter riders. Yes, you need a healthy self-awareness, a clear conviction with which one could cushion the reproach of men, if you were traveling with one of these exotic Ecomobility. Of course, I think in retrospect some in my log reluctantly traded criticism mounted right now. For example, the title of a German magazine, which labeled an e-test vehicle as "atom-mobile". That was not so wrong. For who is fueled with electricity from the public grid, it fueled in large part precisely with nuclear power. With atomic (at that time) or coal power (today) makes an electric car but ecologically little sense. Looking for environmentally correct power I got during my tests again and again in emergency situations. I was about to not get stranded in the middle of the Upper Bavarian prairie, forced to feed my car from a nunnery in Wolfratshausen with 0815-current. The cable was thank God long enough. In addition to the ridicule, had to endure Ökomobilisten occasionally, but there are also many beautiful memories. 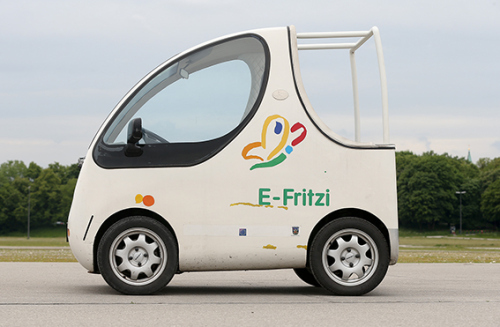 In 1990 I made for the "SZ-Magazin" test drive a city car from the Kassel company ERAD in Hamburg. When I booted the e-midget at the Alster lake, Udo Lindenberg rocked zoom on roller skates, asked a few questions and found that it was a Geilmobil logo. Horny he would certainly have also found that that church community that lent me the city car, got from Hamburg's senator to acquire a grant of 4,500 DM per car seat. Of such incentives can only dream of today. Audi introduced in 1997 together with Siemens a few dozen prototype of a hybrid Audi Duo to the wheels. One of them, I went in ten days about 5000 Kilometers from Erlangen via Munich, Freiburg, London, La Rochelle, Bilbao, Madrid, Toledo, Tarragona, Turin, Mendrisio back Ammersee. In Spain, I was at one of the most interesting solar places over a village, Serra de Llaberia, in the province of Tarragona, located at 700 meters, I went to the town hall and have had to issue a document that I the Audi Duo there with solar power have refueled. It was a very uplifting feeling like I am silent, emission-surfed with the solar power over the mountain ranges. But soon I of course had to switch, I operated by a toggle switch next to the handbrake, and then I continued with diesel. The Audi duo was a diesel hybrid. Such a drive is a rarity today. Another highlight was connected to the electric duck that had some Munich ADAC technicians rebuilt in 200 man-hours for your scooter. With it we have rounded the peninsula Cornwall England. 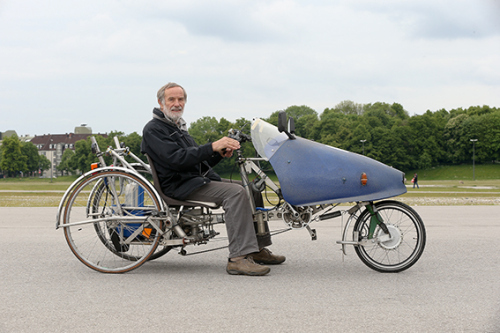 A German team by Hessischer Rundfunk filmed it. "The Independent" Radio Cornwall, all the local papers came. In the morning, when the reports appeared - it was the 08/31/1997 - are all newspapers were full with the fatal headlines from Lady Dis accident in Paris.And yet, reporter and film crew witnessed how the electric duck ADAC near the ruined castle of King Arthur power supply from a wind turbine tapped. The London "Independent" saw the "Gulf Stream Tour" as a historical event: "Probably the first practical example of emission-free automobile vacation in our islands." Later I even invited a native of Cornwall eco-Lord Tyler a the House of Lords at Westminster, so I reported in the context of a princely three-hour meal of the trip. As thoroughly went sailing on some 2000 kilometers through France. The Citroën headquarters in Neuilly-sur-Seine left me for two weeks in October 1997, an e-Saxo. During my tour of Paris was smog alarm on the very day. Excluded from the ban remained only vehicles with electric or gas motor, foreign cars, taxis, ambulances and cars with more than three passengers. According to estimates, the Paris authorities around one million vehicles were due to the ban will go less than usual. In the Vosges La Saxo showed me their recuperative power. On the Place de Verdun in La Rochelle we rested beside two dozen electric Citroën and Peugeot lending and leisure travelers. Against two clock in the morning pioneering spirit was always asked: In villages I headed to the only remaining burning light, almost always the bakery where's power was while I was dozing in the driver's seat for a few hours. During the day I sometimes went to the museum for the time of charging. A few years later I curved in London free by Jules Verne "With 80 rounds of Super Sunshine" Around the World in miniature. 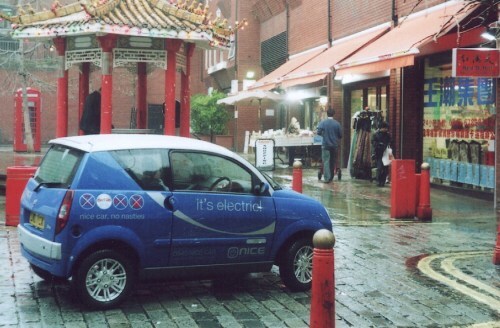 Alternately in snazzy electric vehicles called G-Wiz and NiceCar by the "Balkan", ie the Harringay District, by "India" and Southall and "China" or Soho. On every journey into Central London, I would have in a petrol engine, a "congestion charge" (congestion charge) have to shell out five pounds. E-Mobile were exempt. The solar power I have, however, like finding a needle in a haystack have to look. I was able to find, for example, on a playground, where there was a solar roof. In Munich there was a lack decades of public charging stations. Of the city's works was only one, on Schwabinger Elisabethplatz. 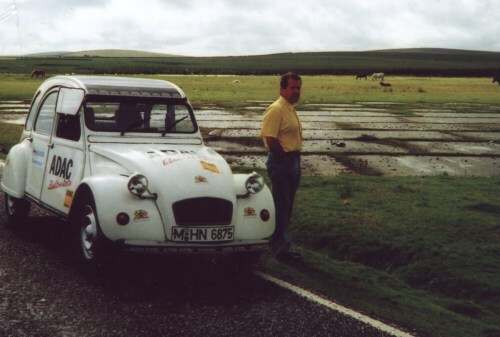 Almost always, when I headed for a test mobile, parked a petrol brettl wide in the Aufladebucht. Nobody expected that there would possibly want to load a electric vehicle. There was hardly any. Finally, the column was dismantled. There had to be a solution. 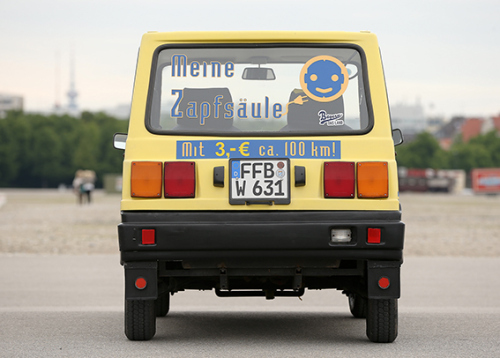 I slowly in the Munich area created an extremely loose, not even reported as eV association pioneer incorrect e-homers: the SOPEC, which stood for "Solar Powered Electric Cars". From today's perspective, one may say: Already over two decades ago, the founding members practiced what BMW CEO Norbert Reithofer now recommends that buyers of electric i3: They ran their electric cars with solar power to them by photovoltaic panels on a own roof or carport brought. Dr. Wolfgang Couturier its pop-e, master mechanic Bruno Dold its Solar I, homegrown, engineer Wolfgang Schreiber's City-El and Dr. Karl Weippert its modified Horlacher say Saxi. Soon I could load of Schwabmunchen in the west to the east in the Chiemgau my test car at about two dozen solar power sympathizers free. 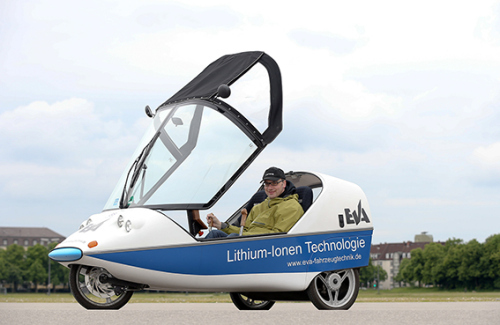 As with Wolfgang Schreiber, the "pure solar 50,000 kilometers driven" certified by the Guinness World Records. Slowly but surely, the electric car seems to be now accepted today with sophisticated technology into mass production. Which is important to me that the scooter its nature remains after most suitable for the commuter who drives back and forth from the countryside to the city. That's what their purpose. At least until the super battery is found, all now looking after. When I go into town today, I let the car stand still at the periphery and drive use public transport. Or I take out my old bike. This is me honestly still prefers. "The plan of the federal government to have a million electric vehicles by 2020, on the road, I give zero chance. There is too little support. In advertising for electric mobility, it would need more whistle and pepper. However, the Munich city authority deserve kudos for the power of e-fueling stations that have been made. The SOPEC that exist unnoticed by the general public for years, I think this is a great initiative. " "Practically I went into the solar scene when I worked as an engineer in DASA Ottobrunn solar technology for satellites. Back in the fifties I had been following the debates in parliament over the issue nuclear or solar path. The Little-usability of solar energy was an important factor in the initial decision, per atom. " "The solar power that I harvest my photovoltaic plant, I save in twelve lead-acid batteries. Two thirds of these are for our budget, only a small part is for my electric pedestal. Thanks to a wonderful inverter, which is fairly new to the market, creating less technically gifted saving. Even on a Upper Bavarian winter I harvest about two and a half kilowatt hours. My homemade takes about 1 kWh per 100 kilometers. 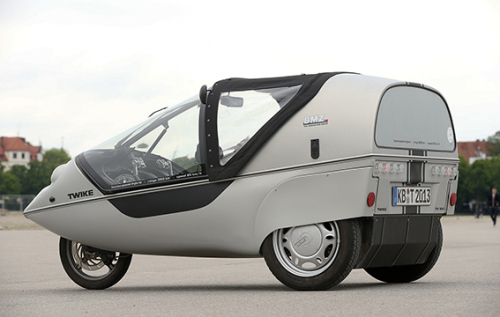 "A car with clean breath as my TWIKE is a small contribution to the health of urban midgets like our two. In the stroller they were on a level with the car exhausts. Against toxic ultrafine particles that penetrate deep into the lungs, there is in this country and in mature petrol still no suitable filter. Since the California Environmental Authority CARB is rigorous. " "People think that cars do not have enough reach. 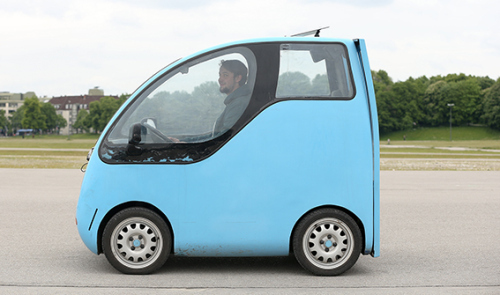 You have not yet excited that even a small electric vehicles such as the penguin is perfect for commuting. The center of Munich and back to Grobenzell on the western edge of the Munich region I have always managed to play with a charge of electricity. " "The exact relationship between car exhaust and allergies, respiratory ailments etcetera can only make our environmental medicine. But as a doctor, I realize that e-Mobile townspeople bring better air. With my Pop-e I make a small contribution to nature conservation in the broadest sense. For my children and grandchildren. But we have in our Autoland a particularly strong lobby against us. The even see any speed limit as sacrilege. " "I work with my brother Martin, who Twikes adapted and markets in natural forest castle near Marburg, where zero-emission vehicles contribute to conservation. Our clients include business people the hustle and bustle of their lives are aware, and our, fast bike 'as' see life extensionists ", the general teaching them a deceleration of their existence. 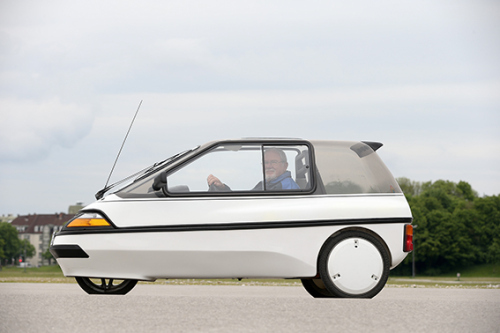 Although the pedal car after all, brings a top speed of 85 km / h. "
"The car's Saxi and is an electric car that was made by a Swiss company as a prototype for a Fair 1996. Because the car is emission-free, we pay no road tax, but insurance costs. All but five or six years you need replacement batteries that cost between 1000 and 3000 Euros. " The quote is from an interview with the online magazine "Now" (http://jetzt.sueddeutsche.de/texte/anzeigen/480114/Was-hast-denn-du-fuer-ein-Auto ). Oliver Weippert is the son of Dr. Karl Weippert, which both belong Horlacher Saxi. Oliver has just passed his examination for master electrician and is from autumn to study at a university in Munich electric mobility.